This report is a first-of-its-kind study of the women's insurance market in the emerging economies of Brazil, China, Colombia, India, Indonesia, Mexico, Morocco, Nigeria, Thailand, and Turkey. Women in emerging economies have growing incomes and buying power. The financial risks they face are also growing, thereby increasing the need for protection. As a result, by 2030, the insurance industry is expected to earn up to USD 1.7 trillion from women alone - with almost half coming from just these ten emerging economies - presenting a significant business opportunity for sustainable and inclusive growth. This global report, "SheforShield: Insure Women to Better Protect All", analyzes the business opportunity the women's market represents for insurers, identifying growth drivers and highlighting women's evolving and growing protection needs in order to ensure the industry develops the most relevant value-added propositions for this segment. It finds the insurance industry has largely overlooked women as a key customer segment - despite significant growth potential in the market. By reaching out to women more effectively, the industry could significantly increase its participation in the economy and further support social and economic development in emerging markets. "The rising share of women with tertiary education degrees, of women who work, who own or run businesses, of women who earn growing levels of income is leading to a changing and expanding landscape of protection needs," said Denis Duverne, Deputy Chief Executive Officer of AXA Group. "Better targeting women across the AXA Group is fully consistent with our priorities, as we believe that women will increasingly fuel tomorrow's growth. We are convinced that the findings outlined in the report will be a key building block towards more concrete initiatives to better cater to women's evolving needs - serving half of humanity to better protect the whole." The rising share of women with tertiary education degrees, of women who work, who own or run businesses, of women who earn growing levels of income is leading to a changing and expanding landscape of protection needs. Better targeting women across AXA Group is fully consistent with our priorities, as we believe that women will increasingly fuel tomorrow's growth. We are convinced that the findings outlined in the report will be a key building block towards more concrete initiatives to better cater to women's evolving needs - serving half of humanity to better protect the whole. This report has been conducted within the larger framework of the global partnership between AXA and IFC, a partnership that aims to develop the insurance sector in emerging markets to contribute to their sustainable growth. The other areas of cooperation between AXA and IFC are: investing in the insurance industry through co-investments or acquisitions, improving road safety, Infrastructure development, Responsible Investments and MicroInsurance. 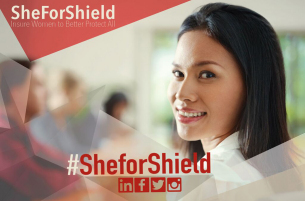 You can also follow highlights of the event on Twitter using the hashtag #SheforShield. Global Care on Demand offers simple and flexible health services for globally mobile individual and SME customers.